Debut author Radha Vatsal draws from her own vivid experiences of immigration from Mumbai, India, and her PhD work at Duke University, to create a new historical mystery series, with Kitty Weeks as her amateur sleuth. 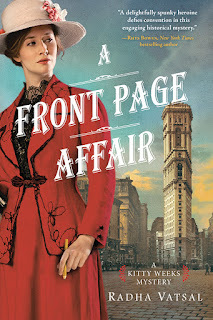 The first title came out this summer and I was delighted that publisher Sourcebooks drew my attention to A FRONT PAGE AFFAIR. 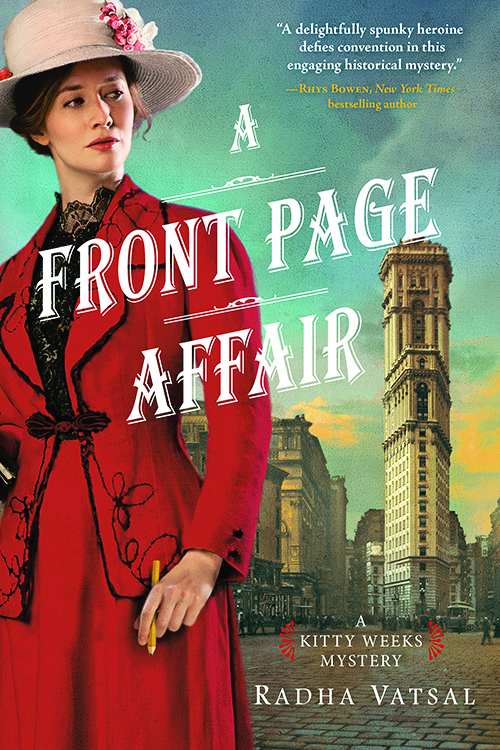 Ignore the cover, which to my eye looks like Julie Andrews playing Mary Poppins in downtown 1915 Manhattan. Jump into the story instead -- of a "Ladies Page" society reporter, young and scrappy Capability "Kitty" Weeks, trying to prove herself to both her newspaper employer and her rather distant father. And over it all, the shadow of what will soon be World War I. "I find it all so confusing," Kitty said. "Is the president trying to say that we deserve to be unharmed because we're neutral?" "That's correct." [Her father] Julian Weeks looked Kitty in the eye. "But there's a war going on, Capability. And the simple fact of the matter is that even neutrals aren't innocent." Soon Kitty's wondering whether her father had deeper, more dangerous things in mind when he said that -- what is his past, which he's never discussed with her? Who is he meeting with in such secrecy? Why is her father's business apparently crossing paths with the criminals who infiltrate high society? Vatsal's writing is deft, vivid, and well paced; the discussion at the end of the book, in which she reveals her own journey, adds much extra interest. I'll be watching for more of this series -- and meanwhile, A FRONT PAGE AFFAIR took the title "Debut Mystery of the Month" from Library Journal earlier this year. Nice!